In-flight Advertising: Opportunity or Nuisance? If you have traveled lately, and noticed, you’ll see a trend. And we’re not speaking of the oft-ridiculed trend of charging for baggage, food, exit rows and other fees. Like the aforementioned fees, this trend too helps airlines with their bottom lines. The trend we’re speaking of is in-flight advertising in commercial airliners. Over the past 5 years advertising onboard, and on the aircraft itself, has been gaining altitude with many of the worlds’ airlines. For as long as we can remember advertising has been a critical part of the business of operating an airline. Of course there are the tie-ins from credit card companies. Rental car companies. Hotels. There is also advertising in inflight magazines and on cocktail napkins. As former cabin crew, we made our share of promotional PAs, placed numerous branded napkins (logo side up, please), and served countless celebrity chef created meals over the years. Lately, however, many other non-travel related business have been seeking ways of elevating their brands and getting the word out on what their companies have to offer. As to be expected, there are many opinions as to how advertisers and the traveling public feel about this. Some think it is intrusive (“Can’t I just get on board and be left alone?”) others see it as a necessary way of doing business and increasing revenue. According to Ray Neidl, an analyst with Calyon Securities, if the ads are done in an appropriate manner, “it may be a long-term trend to raise additional revenues.” For the frequent flyer, many see onboard advertising as inappropriate, overreaching, and a nuisance. Some even call for advertising to be restricted to inflight magazines. From an advertisers point of view, think about it: You have a captive audience (we were going to say an audience being held hostage however decided against that word) who may spend anywhere from 30 minutes on regional jet, to over 14 hours on some ultra long-haul flights. So, if your target audience is a captive audience, why not advertise to them? Therein lies prime revenue potential and advertisers are willing to pay lots of money to be able to advertise to an audience that has no other place to go. Airlines have long protected the real estate of the interior and exterior of their aircraft. A plane is like a canvas. Broad. Blank. Moving. Seen by many. Many airlines have special liveries for aircraft. Now defunct airline, Western Pacific, had over 10 aircraft with special liveries advertising casinos, rental car companies, and cartoons. Southwest Airlines currently has over 25 special livery aircraft, most notably Shamu promoting their relationship with Sea World. Where many airlines including American Airlines, British Airways, and Delta Air Lines have special livery aircraft, not many have ventured down the road of advertising inside the airplane. Enter Ryanair. Founded in 1985, the Irish, Dublin-based, low-cost airline operating a fleet of over three hundred B737s is changing how advertising is viewed inside airliners. Twenty percent of Ryanair’s revenue is derived from ancillary revenue (sources other than the price of the ticket). Because profit margins are extremely thin and volatile in the aviation industry, Ryanair has taken the often unpopular stance of looking at all avenues to raise addition revenue. According to the Ryanair website, “display advertising is one of the most effective media formats available. Three years of research shows that advertising brands are achieving not only recall but specific message recall in excess of 82% among passengers.” On Ryanair you can find advertising on tray tables, walls, and overhead lockers (overhead bins). Another airline that is embracing this trend is USAirways. They are noted as the first USA-based airline to advertise on tray tables. According to a 2006 story from Marketplace American Public Media, USAirways received over $10 million from onboard advertising. By 2008 that number had grown to $20 million for all of its advertising methods. Global Onboard Partners is positioned as one of the major players in in-flight advertising. This new global advertising and media company, based in Atlanta, has gained FAA certification and provisional patents for its unique advertising products. Global Onboard Partners currently works with both low-cost and legacy carriers in several regions across the world, including the Caribbean, Europe, India, the Middle East, Mexico, and the United States. They first made use of this new technology in 2008 when Spirit Airlines partnered the Bahamas Ministry of Tourism to transform cabin interiors into a tropical scene complete with blue skies, sandy beaches, and turquoise waters. Reports indicate the purchased advertising space was well received by customers and crews for its beautiful calming effect. “Placing advertising on surfaces of the interior of an aircraft is a complicated and regulated process. We selected [Global Onboard Partners] due to their expertise and experience in this relatively new, but sure-to-be-seen-more-of medium,” said Michael Pewther the Senior Director – Sales, Spirit Airlines. With ad dwell time averaging 2.5 hours and recall rates up to 94%, according to Global Onboard Partners, we’re sure to see more of this type of advertising. As with most points of view, balance is key. As airlines continue to experience the ebb and flow of market forces, they’ll need to consider other forms of revenue. In-flight advertising is a sure, and proven way, to bridge the revenue gap. On the other hand, airlines must be mindful as to how they approach in-flight advertising as not to alienate the very core of their business: the passenger. airlineguys™ are Sylvester Pittman and Darin Topham. Aviation enthusiasts. 30+ (and counting) combined years of airline operation/leadership/PR experience. Former cabin crew. Discerners of great customer service. This entry was posted in Uncategorized and tagged advertising, airlines, global onboard partners, in-flight advertising. Bookmark the permalink. Thank you for including Global Onboard Partners in your article on in-flight advertising. We pride ourselves on creating the most creative and effective advertising campaigns for the commercial airline industry. While some travelers dislike advertising inside the aircraft, we find this to be a small — and shrinking — minority of flyers. 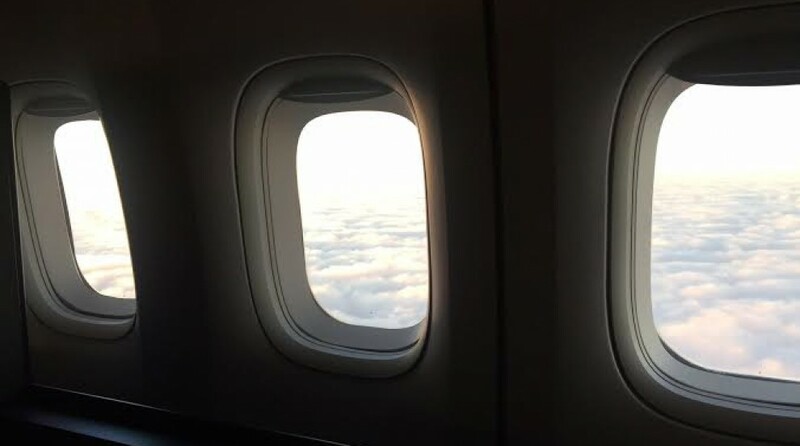 In fact, the revenue generated by airlines from in-flight advertising helps to offset fees and keep airfares lower for the majority of ticket buyers. We would love to receive more feedback on how flight attendants and frequent flyers feel about in-flight advertising and how we can continue to improve. I definitely don’t think nuisance as at worst I think the response is indifference however, even those who fall into the category are still likely recall the message after a period of time on board. Many of the advertisements are aimed at brand reinforcement and therefore don’t necessarily have a call to action. The real question for onboard advertising is relative brand proposition of both the airline and the advertiser and how each impacts on each other, for example high end jewellery potentially may not fit with a low cost airline product, likewise premium airline brands are unlikely to want to taint their brand with lower level consumers goods. This has meant that there has been limited uptake with some airlines cautious to implementing it for fear of affecting brand perception. Ultimately, in its current “billboard” style the medium is very much in its infancy but the real exciting stuff will come in the next few years as airlines and advertising partners move towards a smarter integrated retail approach utilising technology, especially mobiles and tablets. The challenge will be how to engage passengers in a smart way in which they do not find excessive but also in a way in which they choose to participate, perhaps through use of IFE or augmented reality applications. Through such use of technology airlines will be able to open up onboard sales in areas that they have traditionally been unable to serve extending the window in which they can sell to the passenger. The key to doing this successfully will be making it enjoyable and unobtrusive to passengers allowing them to be engaged when and how they wish to be engaged. For example inflight magazines will go from being static print media with advertisements and content to fully interactive solutions enable the passenger to interact with content in real time enabling them to purchase and interact with content and advertisers. Onboard promotions will also become more “gamified” enabling advertisers to move beyond the static advertisement to something interacting with passengers in an entertaining way which makes them want to engage with onboard content. Like it or not, in a future with yields are going to be constantly under pressure from rising fuel costs, onboard advertising is here to stay as it is a relatively simple way to add additional revenue. As onboard advertising evolves and becomes smarter there is a lot of potential from this to move into a wider range of airlines but in such a way that does not negatively impact on the brand experience. Thank you for your thoughtful reply and insight. We too will be watching as the trend of onboard advertising takes flight.